The Meeting of the Council of Foreign Ministers of the Member States of the Shanghai Cooperation Organization (SCO) will be held in Beijing on April 24. At the invitation of State Councilor and Foreign Minister Wang Yi, Minister of External Affairs Sushma Swaraj of India, Foreign Minister Kairat Abdrakhmanov of Kazakhstan, Foreign Minister Erlan Abdyldayev of Kyrgyzstan, Foreign Minister Khawaja Muhammad Asif of Pakistan, Foreign Minister Sergey Lavrov of Russia, Foreign Minister Sirodjidin Aslov of Tajikistan, Foreign Minister Abdulaziz Kamilov of Uzbekistan, Secretary-General of the SCO Rashid Alimov and Director of the Executive Committee of the SCO Regional Anti-Terrorist Structure Yevgeniy Sysoyev will attend the meeting. All parties will exchange views on the SCO cooperation in various areas and major international and regional issues. Foreign ministers of Russia, India, Kazakhstan, Kyrgyzstan and Pakistan will visit China while attending the meeting. This is the first meeting of the Council of Foreign Ministers of the Member States after the enlargement of the SCO, which aims to lay the groundwork for the Qingdao Summit to be held in June. During the meeting, the Chinese leadership will have a group meeting with the heads of delegations. State Councilor and Foreign Minister Wang Yi will chair the meeting. Foreign ministers of the member states will exchange views on the SCO cooperation across the board and major international and regional issues, ink a series of outcome documents and issue the press communiqué on the basis of the consensus reached at the meeting. China believes that all parties will take this meeting as an opportunity to build up more consensuses on cooperation, roll out more measures for cooperation, ensure that the Qingdao Summit can achieve fruitful outcomes and promote the greater development of the SCO. Q: According to reports, US President Donald Trump said on April 17 that his meeting with the DPRK leader Kim Jong-un would take place in early June or a little before that, assuming things go well. The US and the DPRK have had direct talks at very high levels. Reports also said that CIA Director Mike Pompeo had made a secret visit to the DPRK. How does China view this? Is China willing to play a role in the upcoming US-DPRK summit? A: We have noted the relevant remarks of the US side. China welcomes the direct contacts and talks between the US and the DPRK. Just as a proverb goes, "Well begun is half done". We hope that the dialogue between the DPRK and the US will be held smoothly and achieve positive outcomes. "When earth piles up into mountains, wind and rain will originate thereof." We hope that all relevant parties will begin and continue with their talks, accumulate mutual trust and build up consensus. We expect them to follow the "dual track" approach to advance the political settlement process of the Korean Peninsula issue, so as to promote and achieve the denuclearization on the one hand and establish the peace regime of the Peninsula on the other hand. In this process, the legitimate security concerns of all relevant parties need to be accommodated to form a package solution so that the long-lasting peace and stability will be realized on the Korean Peninsula. As a close neighbor to the Korean Peninsula, China always firmly stays committed to the political settlement process of the Korean Peninsula issue. We lend positive support and remain open to all the efforts that are conducive to resolving the Korean Peninsula issue peacefully through dialogue and negotiation, and stand ready to continue with our positive and constructive role to this end. Q: You just announced that the Russian Foreign Minister will pay a visit to China. Can you clarify if it is going to be on the same day, that is April 24 when the Meeting of the Council of Foreign Ministers of the SCO will be held or will he stay one day more? A: According to the mechanism of annual reciprocal visits between Chinese and Russian foreign ministers and the arrangement of multilateral meetings, Russian Foreign Minister Sergey Lavrov will pay an official visit to China and attend the Meeting of the SCO Council of Foreign Ministers from April 23 to 24. President Xi Jinping's Special Envoy, State Councilor and Foreign Minister Wang Yi just paid a successful visit to Russia in early April. Foreign Minister Sergey Lavrov is about to pay an official visit to China. The two sides achieved reciprocal visits within a month, which speaks volumes for the uniqueness of China-Russia relations that are developing at a high level. During the visit, the Chinese leadership will meet with Foreign Minister Sergey Lavrov and State Councilor and Foreign Minister Wang Yi will hold talks with him. The two sides will compare notes on the arrangement of the recent exchange of high-level visits and exchange views on the international and regional issues of common interest. We believe that this visit will further consolidate the sound momentum of the high-level development of China-Russia relations and enhance our strategic coordination in international affairs. Q: US President Trump said yesterday that he was giving his blessing to discussions of a possible peace treaty between the DPRK and the ROK at the coming talks. China was a signatory to the Armistice in 1953. How does China look at a possible peace treaty now? Under what conditions does China think that the peace treaty should be signed? A: We have seen that thanks to the concerted efforts of the DPRK, the ROK and other relevant parties, the current situation on the Korean Peninsula has witnessed a sound momentum of abatement. We commend and appreciate this. We believe that advancing the denuclearization of the Korean Peninsula and establishing the peace regime for negotiation in parallel in accordance with the "dual-track" approach is an effective way to fundamentally resolve the Korean Peninsula issue. As an important party concerned to the Peninsula affairs and a signatory to the Korean Armistice Agreement, China will play a positive role in this process. Second, we should stay committed to the "dual-track" approach, namely, striving to denuclearize the Peninsula and establish the peace regime in parallel. The Korean Peninsula nuclear issue is closely related to the security threats facing all relevant parties, the DPRK in particular for a long time. When advancing denuclearization, addressing the legitimate security concerns of the DPRK is a reasonable requirement and a necessary step to achieve denuclearization. Third, we should stay committed to seeking a package solution in stages and in a synchronized way. The Korean Peninsula nuclear issue has been there for long time and there is a lack of basic trust between relevant parties, especially between the DPRK and the US. The peace process should be advanced under the precondition of denuclearization and with the concerted efforts of all relevant parties step by step. All relevant parties need to shoulder their due responsibilities and obligations at every stage. Only in this way can we ensure that the peace process is sustainable and the dialogue and negotiation will not be interrupted. As a close neighbor to the Peninsula, China is willing to continue with its constructive role in promoting the settlement of the Peninsula issue in the right direction. Q: On Monday, you introduced that recently there have been frequent exchanges between the Chinese and Indian governments. What is the major mission for the visit of the Indian Minister of External Affairs to China? A: As two major developing countries and emerging markets, China and India are each other's important neighbors. The leaders of the two countries have set the goal of forging an even closer developmental partnership, which has guided bilateral cooperation in various areas to make great progress. Since the beginning of this year, China-India relations have witnessed a positive momentum of development. China stands ready to work with India to maintain the exchange of high-level visits, expand pragmatic cooperation, properly manage differences and move forward bilateral relations. 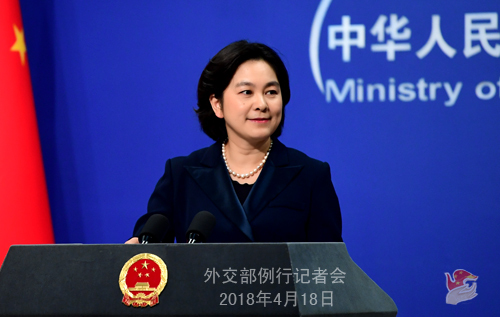 At the invitation of State Councilor and Foreign Minister Wang Yi, External Affairs Minister Sushma Swaraj of India will pay a working visit to China while attending the Meeting of the Council of Foreign Ministers of the Member States of the SCO. 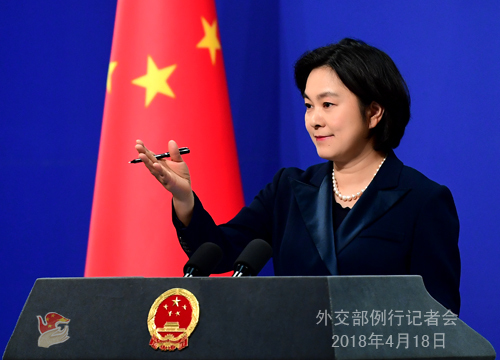 During External Affairs Minister Sushma Swaraj's visit to China, State Councilor and Foreign Minister Wang Yi will hold talks with her, during which the two sides will have an in-depth exchange of views on China-India relations and international and regional issues of common interest. We believe that External Affairs Minister Sushma Swaraj's visit to China will further enhance political mutual trust and promote the sustained and steady development of China-India relations. 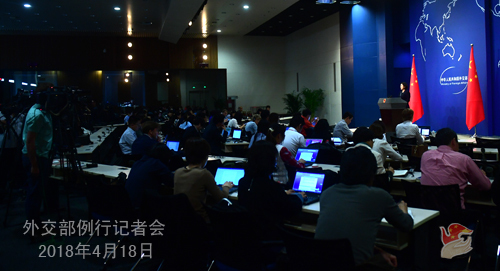 Q: According the Associated Press, the report issued by a US-based think tank on the evening of April 17 on the Belt and Road Initiative concluded that relevant projects under the initiative aren't driven by win-win economic development but appear to generate political influence, expand China's military presence and point to China's security intent. The report also claimed there's a lack of transparency in those projects. What's your reaction to that? A: I have noted the news report by the Associated Press (AP) this morning, but yet to read the specific report it mentioned. In fact, the AP raised this question to the Spokesperson's Office via fax yesterday morning and we have given a detailed reply. But to our regret, the AP's report today quoted only a sentence or two, and the report is lopsided. Over the past five years since it was put forward, the Belt and Road Initiative has been well received and supported by over 100 countries and international organizations, and over 80 of them have signed cooperation agreements with China. Just think about it. How could this initiative have won so extensive response and support if it were not in keeping with the trend of the times, not for the benefits of people of countries around the globe or short of vigorous vitality and bright prospects? First, the Belt and Road Initiative in essence is for economic cooperation, with the core aim of strengthening economic cooperation and promoting common development through infrastructure and across-the-board interconnectivity. We hope that the Belt and Road Initiative will help create the physical and cultural environment for interconnectivity, expand global effective demand and consolidate the overall trend of global economic recovery. Second, the Belt and Road Initiative is transparent. China follows the principle of extensive consultation, joint contribution and shared benefits to advance the cooperation under the Belt and Road Initiative. Whether in cooperation planning or projects implementation, everything is decided through consultation and operated in an open and transparent manner. China has no geopolitical calculations, seeks no exclusionary blocs and imposes no business deals on others. Third, the Belt and Road Initiative is mutually beneficial and win-win. It is designed to serve both China's all-dimensional opening up and the interconnected development of world economy. It aims to share with others China's development opportunities to achieve common prosperity and help resolve the development problems facing the world. It is indeed a Chinese proposal for promoting global development cooperation. In that process, China always sticks to market-based operation, accommodate the interests and concerns of various parties, seek the largest converging interests and common ground for cooperation and bring into full play all parties' strengths and potentials. In fact, a large number of cooperation projects have been implemented or being implemented, which plays a positive role in promoting local socioeconomic development and increasing the benefits of local people. To sum up, I would like to remind the relevant people who cooked up this report that if they continue looking at others as well as the world with dark thoughts and through tinted glasses, they will see everything as darkness and traps. On the contrary, if they are open and broadminded enough, they will find a sunlit world that is bright and warm. Q: Are there any details you can give us on the current drills in the Taiwan Straits? There are reports saying that they are larger than previous ones. What's your comment? A: I would like to refer you to the military or Taiwan Affairs Office of the State Council for this question. Q: According to reports, the head of the Taiwan region Tsai Ing-wen started her visit to Swaziland yesterday, her first "visit to Africa" since taking office. Do you have any further reaction to that? A: There is only one China in the world, and Taiwan is an indispensable part of China's territory. The government of the People's Republic of China is the sole legal government that represents China. This is not only recognized by the relevant UN resolution, but also constitutes the universal consensus of the overwhelming majority of countries around the world. The China-Africa Comprehensive Strategic Cooperative Partnership is maintaining a sound momentum of development now. The upcoming Forum on China-Africa Cooperation (FOCAC) summit in Beijing this September will surely set off a new surge of China-Africa cooperation. The Gambia and Sao Tome and Principe's return to the big family of China-Africa friendly cooperation fully indicates that the one-China principle is an irresistible trend that meets the aspiration of all people. We sincerely hope that the relevant African country will get a clear understanding of the general trend of the world and join our big family of China-Africa friendly cooperation at an early date.